You've got a interesting ability to dissect stuff and determine if it's a lot of crap or not. It seems all very dodgy to me, but interested in your thoughts. This site is a great example of the breed; among other things, it mentions the famous (in certain circles) Charles Nelson Pogue patents from the 1930s. You can patent almost anything, of course, whether it works or not, but the fact that those patents do exist is still, frequently, used as evidence that the Pogue carburettor worked as advertised. Because the miracle carburettor is such a classic automotive myth, there are many excellent articles about it. Here on Snopes, for instance, and here on The Straight Dope. Tony of fuelsaving.info has a page about atomisation gadgets, too, in which he explains why no possible carburettor could work any better than fuel injectors do, as can be proven by, for instance, looking at engines that run on gaseous fuel. The maximum theoretical efficiency for any heat engine, including internal-combustion engines, is equal to the absolute-temperature difference between the hot and cold ends divided by the temperature at the hot end. To put it another way, a heat engine takes a high-temperature thing and extracts some energy from it, sending whatever energy it can't extract to its heat-sinking exhaust. For an internal-combustion engine, the hot thing is the fuel burning in the cylinders and the heat-sink is the atmosphere - and, to get the calculation right, that "absolute temperature" thing means you need to use Kelvin or some other starts-at-absolute-zero scale for the temperatures. The bigger the temperature differential, the more efficient the engine. This is why steam engines need their steam to be so very hot, and also why Smokey Yunick's Hot Vapor engine quite possibly got better mileage than even the most advanced car engines do today. Shame about that little "setting everything else in the engine bay on fire" problem. Anyway, even if aliens have given you a perfect internal-combustion engine, its ceiling efficiency is still cappped by this calculation. Given the combustion temperature in internal-combustion engines and typical ambient temperatures, the maximum possible thermal efficiency for an internal-combustion engine is up around seventy per cent. No real engine actually manages much more than 25%, but about 70% is the limit. The "200 mile per gallon" carburettor is supposed to work on ordinary big dumb American engines, whose fuel-efficiency without the magic carburettor is, let's say, 25 miles per gallon. If you boost a 25-mpg engine to 200-mpg, you must have improved its thermal efficiency by a factor of 200/25, which is 8. But we can empirically calculate, by measuring combustion-chamber and exhaust temperatures, that its initial thermal efficiency is about 20%. Multiply that by 8 and you get one hundred and sixty per cent, way off the end into perpetual-motion territory. Even if it was a really fuel-efficient engine to start with, getting 40 mpg, and you're only talking about a one-hundred-mile-per-gallon miracle carburettor, you're still improving by a factor of 2.5. This is, at least, theoretically possible - assume 20% efficiency to start with, multiply by 2.5, and you get only 50%, below the theoretical maximum. But in all the engine labs of all the world, in all the sheds and garages and universities and giant car companies, there is no evidence that anybody's ever made an internal-combustion engine that is that efficient, unless it runs at spectacularly unmanageable temperatures. It's perfectly possible to make a car, or even a motorcycle, that contains a very very hot engine of one kind or another. But the "miracle carburettors" never say anything about that. They're just bolt-on devices for normal engines, promoted with the usual BS about making the fuel burn better or swirling it around or something. Modern engines provably burn fuel very nearly optimally, so there's not anything to actually gain there. But the myths will never die. The miracle carburettor is like the Loch Ness Monster; no amount of scientific investigation or logical argument can ever prove it's not out there, somewhere, in the mist. Modern turbodiesels are typically claimed to have efficiencies in the low 40% range. Moreover, since they're unthrottled, they run at or near this efficiency across their entire load range. "I came to understand this secret of cracking the gasoline down into smaller hydrocarbons and why it really could yield unbelievable gains." I don't understand why people believe that breaking down the hydrocarbons in gasoline into "smaller" or "simpler" forms is a good thing. Used to be a time when 100 Octane fuel meant that what you were buying performed as if it was made of 100% Octane. Octane behing a Hydrocarbon chain which is made of eight hydrocarbon molecules. In this form, the hydrocarbon fuel is most combustible, but if you shorten the chain by one hydrocarbon, you have heptane, which is one of the least combustible substances. To borrow inspiration from the author I've quoted above, I'm an IS Manager, not a physicist/chemist/whatever's appropriate, so I don't know for sure, but I'm going to guess that since Octane is the most desirable hydrocarbon form, I'll guess that Quadrane (four hydrocarbons) isn't going to perform any better than the best form. From my desk here, I'd say that the better practice would be to eliminate the carbon (it's just going to end up on your platinum-tipped sparkplugs anyway) and burn the hydrogen with intake air. I'd prefer to run my car on Johncoltrane. I could be remembering wrong, but I was under the impression that octane is in fact not a measure of how well it burns, but of how well it resists spontaneous burning before the spark (piston knock). The higher the octane rating of a gasoline, the higher compression it can be run under before it starts having problems with igniting (diesel style) from the heat of compression, causing premature ignition, engine knock, loss of power, and at times severe engine damage. It's actually the higher compression that results in more power and/or better fuel efficiency. Modern engines are able to make adjustments to the engine to reduce piston knock when lower grade gas is used, resulting in lower fuel economy. (for those not in the US, please feel free to mentally replace all of my reverences to "Gas" or "gasoline" with "petrol"
@ Abfarrer, close, but not quite there! The blend could have very little octane in it, but still perform as if it had a higher percentage of octane. Octane rating can in fact be in excess of 100, as not a few hydrocarbons have anti-knock qualities superior to octane. Propane, for example, has an effective octane rating of about 110. At least as the US reckons. All countries are probably different, for maximum confusion. Tolulene also has an octane number in excess of 100, ~130 iirc. There are also multiple standards; RON is research octane number, MON is Motor Octane Number. Research is the number achieved in a bench test of an ideal engine under zero load. Motor is tested under load. In the US, the number you get is usually an average of the 2. In Australia, you get the RON on the bowser. I believe the zero point for RON is n-heptane, while the given 100 point is 2,2,4 tri-methyl pentane. There is something weird about hydrogen getting an octane rating, but I don't remember what. Something about flame speed vs ignition temp. I like that modified Metro. Seems most even econoboxes now have a massive frontal area. Everyone has to have at least 2-3 feet of headroom and be able to spread their arms without touching anything. I used to drive a 77 Ford 4.9L V8 XC wagon. According to the Owner's Manual it weighed about 1.7t of solid steel. The Missus bought a 2000 Toyota 4 cyl 2.0L Camry sedan. And according to the Owner's Manual, it weighs 2.6t of plastic and tin foil. Performs like it's towing three tonnes, too, but uses half the juice of my old half-the-weight '70s car. Maybe we should put modern engines in old cars? I'm looking at the Owner's Manual now (for the second time in nearly a decade). It says 1825 kg for the 4 cylinder sedan, 2035 kg for the V6 wagon, Gross Vehicle Mass. And where the hells is Wiki getting its numbers? OK. My next question is: WTF didn't they put the curb weight in the manual?!?! I like to know these things. They're important. I think those GVM and kerb-weight numbers aren't for the same model. If the 1489kg curb weight is accurate (actually, we know it isn't, because it's the weight for the current model and your Camry is a 2000), a 1825kg GVM lets you carry only a 336kg load. Four only-slightly-plump 84kg (185-pound) adults would use that all up and leave you unable to carry any luggage unless you left the spare wheel at home :-). I just looked up the Australian Camry specs. The GVM-minus-kerb-weight values for the four silly-named variants, the Altise, Ateva, Sportivo* and Grande, are 515, 485, 480 and 485 kilograms, respectively. So for four passengers to use the entire load capacity of any current AU-model Camry without luggage, they'd all need to weigh at least 120 kilograms (265 pounds). 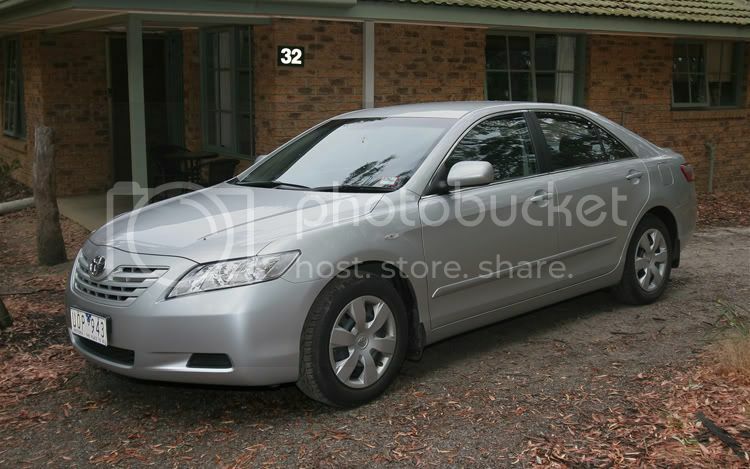 * I actually really like the look of the current Camry - very space-shippy. But it's still a Camry, so it's still the car that says you want to die but lack the courage to go through with it. If you buy the "Sport" model, it just means you have not yet consciously realised that you want to die. "Toyota Camry: Because your dishwasher doesn't have wheels." I can't stand the new Camry, partly because the badging appears cockeyed, partly due to the wart on the nose, and partly because nearly all the ones I run across are base-models with hubcaps that just ain't centered properly. The North American model is here. I see that yours is nearly identical. You'd think people would at least buy a similarly-sized but slightly-more-interesting Accord, at least. Well, I'm thoroughly chastened. A 2000 model is ~1400 kg. Now I have to make up another story why my '70s shwagon was awesomely superior to new cars. Did I mention the sound? From that, I went to a '83 Nissan EXA turbo. 1.5L, 930 kg, 77 kW. Uses 7.5L of Juice per 100km. I enjoy contrast. This was built only 6 years after my 1.7t, 20L/100km wagon, and went just as fast. What gets my goat (and the point I'm trying to make), is that we've been able to build light, efficient cars with plenty of power for decades, now. I'd say the EXA was before its time, but since then we seem to have gone backwards! Cars are getting bigger, fatter, squarer, greedier! Just look at all the Toorak Tractors! Automatics, too! You don't put automatic transmissions in four wheel drives!! It's an abomination!!! AN ABOMINATION!!!! *ahem* As I was saying... The 2000 Camry is a decent, utilitarian car (so? It's a dishwasher). The new ones look stupid. Some marketing genius is trying to hack 1920s (not aerodynamic) grilles on the front. But, I'm different. Very choosy. And not easily lead by the "market forces" of marketing "geniuses". BTW, Dan, I'm not grocking your Camry = Die thang. Care to elaborate? I think what he's saying is that Camrys are for pensioners and people with no soul. Also, the EXA/Pulsar/NX of the '80s was brilliant - but then, anything with T-tops and an optional removable wagonback has to be. How do you say "people's car" in Japanese? Those wagonbacks are a strange mix of attractive and repulsive at the same time. Kinda like the taste of mushrooms, it's a whole different flavour. The shape of many recent cars, including the Camry, is partially dictated by safety regulations. The bulbous noses that've been sprouting on all sorts of cars, for instance, are there to raise and smooth the point where the pedestrian bends to smack his face on the bonnet, and thereby reduce the speed of said smacking. I like the way the current Camry shape implements this, but it is of course a matter of taste. You can still get pretty lightweight cars with modern safety features, though. If you're in the States it's arguably not a great idea to drive an MX-5, Fiat Panda, Nissan Micra or whatever, on account of all the cavemen zipping around in pickup trucks and SUVs who can barely even see you. But in countries where the top ten selling cars aren't more than half "commercial vehicles" with pollution-regulation exemptions, you really can still get reasonably light, nippy cars that won't try to kill you, or someone else, once a year. New cars don't need radiator grilles. Haven't for several decades. They're inefficient. And cheese-graters for stoopid pedestrians. So why are they back? I've had two crashes in 20 years. Both in the tonnes wagon. When some idjut gets in the way, half em vee squared. I only have a minor nit to pick with: "Lighter cars stop quicker." Given adequate braking systems and appropriately scaled braking capabilities, the mass of an average consumer vehicle should have no significant effect on its ability to stop in a single, isolated, fast stop event. All of the qualifications are there just to handle the fact that a larger vehicle will have more kinetic energy which the brakes need to dissipate leading to possible fading on larger vehicles. All other things being equal though (tires, road surface, etc. ), the extra mass will result in a larger momentum which must be arrested; but, it will also provide a greater normal force for the load bearing surface contact (the tires) and as dry frictional forces (static and kinetic) are proportional to the normal force, the increased load will increase the force which may be applied to the vehicle by the road. Now, the normal force is linearly proportional to the mass, and the acceleration response to a force by an object is linearly proportional to the mass, therefor, all things being equal, the mass of the object does not have an effect on the time or the distance it will take to stop it. Of course, when you're dealing with a big rig truck, and stopping one of them hard pulls the road along with it a bit, and the brakes turn to molten steel...well, then we're not talking about the same situation. So, sorry for the narrative, but; no, having a smaller car will not make you stop faster than a normal big car that is properly configured. Dan: The only problem I have with the Camry's nose is the "wart" under the Toyota logo. What's that there for? Is it a "nose"? Ack. It's fine aside from that, but I just want to take a rubber mallet to each of 'em until the odd lump goes away. shimavak - "but; no, having a smaller car will not make you stop faster than a normal big car that is properly configured." If you had've said "not necessarily" and left out your opinion that lighter cars are not "properly configured", I might have given you some credit. I say a one tonne car with 6" tyres will stop quicker than a two tonne car with 7" tyres. But I can see we're not going to come to any agreement, so it's braking at dawn! Or... Maybe we could ask MythBusters? We could also ask them to test the difference between ABS and a driver trained in emergency braking! John Henry style. Robot verses Human! I'd pay to see that! I'm sorry I didn't quite say it how I wanted to. My implication was not to be that a small car is "not properly configured," but rather that a large vehicle, when given brakes appropriate to its size (ones that will not experience fade over the duration of the single stop, and that can also "lock" the brakes at any speed) will be able to stop in quite nearly the same distance as a small vehicle. I personally own a tiny little 1-ton CW Saturn Sky and it has a 70-0 MPH braking distance of 168ft. I am not suggesting that there are not light cars which stop faster than heavy cars; I am simply saying that a light car does not mean that you WILL stop faster than a heavier car. The physics of the problem are really quite simple. What can help a car stop faster is any aerodynamic design features with the intent of providing down force, of course at lower speeds these become less relevant (fluid friction being dependent on v^2), but at high speeds extra down force means a greater normal force, which means more force that the road can apply to your vehicle. Small cars are usually designed to employ some decent down force to help all forms of traction, braking being one of them. You'll probably not find a pickup truck designed with a front air dam and rear spoiler (a real one...) to give any benefit, so that may make up some of the difference. If I stick a ton of bricks in my little car right at the center of mass, I should be able to bring it to a stop (if I'm not fade limited) in the same distance as I can without. As for tire diameter, and nearly any other argument, I submit that you can look at the car as a whole system. Completely ignore the internals of the vehicle, when you brake, you are trying to get the road to push you in the opposite direction of your velocity. The contact point of your car to the road is the contact patch of the tires. If you apply the maximum amount of braking possible, you lock the tires. You are then dealing with the kinetic friction regime, with coefficients of friction usually much less than those for static friction. If, however, you get the tires to apply infinitesimally less force to the road than the "breakaway" force, you are in the static friction regime. This is what an ABS system lets you do. The frictional force between the tire and the road is described by F=N*u, where u is the coefficient of friction. The acceleration of a mass under the influence of a force is: F=ma. Our force is friction, the normal force is N=m*g, so our braking acceleration is given by m*a=m*g*u. That is, a=g*u. The mass of the stopped object never enters into it; nor does the tire size, rolling resistance, or any number of other features. There is a qualification with this, of course, and that is that the coefficient (u) can change based on temperature, and myriad other parameters, but it does NOT depend (in the first order) on the contact patch. Basically, if your car can lock up its brakes, it can stop in roughly the same distance as any other car. As for the ABS vs. Human, it would be quite interesting. I'd wager it could be close as a human might not apply the maximum force that they could, but an ABS system pulls off the brakes a bit more than it needs in order to switch back from kinetic friction to static friction. Lock up the brakes just once in stopping though, and the ABS will win by a long shot; I figure, at least, due to human reaction times. P.S. Sorry this is such a ruddy long comment! I can shuttup if desired. « Greener Gadgets: This time for sure!